Just because you qualify for a mortgage doesn’t mean you can actually afford the house; consider how much you can actually pay for a home. It’s a good idea to buy something with slightly lower payments and leave yourself funds if one of life’s emergencies occurs. 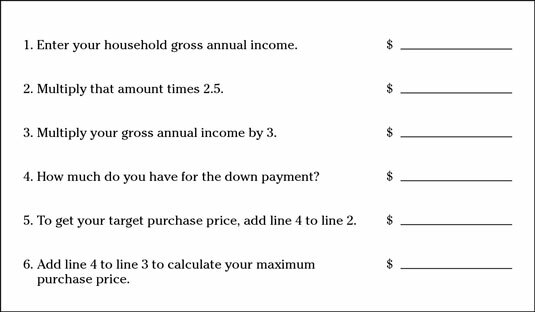 Included here is a worksheet that lets you compute the maximum amount you likely can afford to spend on your monthly mortgage payment. Click here to download and print the Housing Cost Guidelines Worksheet. 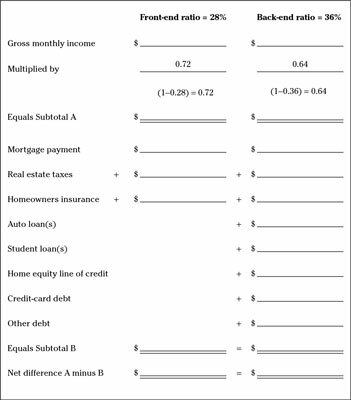 After you fill in the Housing Cost Guidelines Worksheet, you can then use this monthly mortgage cost to compute how much house you can afford to buy in the Mortgage Qualification Quick Test Worksheet. Click here to download and print the Mortgage Qualification Quick Test Worksheet. If you have a positive number on the last two lines of the Housing Cost Guidelines Worksheet, you have met the healthy borrowing guidelines. Even if you have a negative number in either the front ratio or back ratio columns, you may be fine carrying this much debt. However, exceeding both ratios for any length of time is unwise. Your real estate agent and mortgage lender are there to help you buy as much house as you can qualify to buy. That doesn’t mean that you can afford it. Real estate agents and some lenders couldn’t care less about these “old-fashioned” guidelines. Lenders giving money to people who don’t have decent credit or much income is a big contributor to the worldwide financial crisis. Watch out! They aren’t doing you any favors. Keep your total housing costs to less than 28 percent of your household gross income, and total debt (including housing costs) under 36 percent of gross income. Another guideline for determining how much house you can afford — one you may have heard about — is that you can qualify for a mortgage equal to 2.5 to 3 times your gross annual wages. These results are remarkably similar to those produced using the front- and back-end ratios, but they’re not as precise. However, this simple calculation will get you in the ballpark.